An incredible amount of repetitive handling of incoming raw materials and outgoing finished goods are pallet-loads of cardboard cartons and Kraft paper bags. Cartons are frequently in the 40-50 Lb. range and can go as high as 400 Lbs. Product in Kraft Paper bags is typically at 50 and 100 Lbs. Repetitive lifting of these heavy objects in the workplace is a common cause of back injuries. The high air flow (generally over 100 cfm) provided by the regenerative blowers used with vacuum lift tubes will compensate for porosity and allow a safe grip and lift. Vacuum lift tube systems generally operate at 10 – 20 in. Hg. Beforel high air flow vacuum lift tube systems were introduced, there were no safe and reliable methods for lifting very porous loads. Vacuum was created by converting compressed air into vacuum via venturi tubes. This method will generate high vacuum levels of 23-28 in. Hg (Pure vacuum at sea level is 30 in. Hg), at air flows of less than 50 cfm. 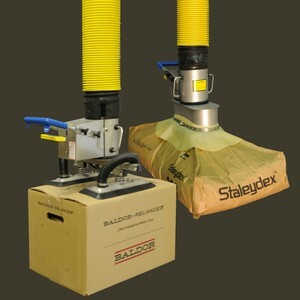 This type of vacuum is suitable for non-porous loads with smooth surfaces, but the air flow is insufficient to compensate for air loss through typical porous load mediums such as corrugated carton flaps and Kraft paper bags. COST SAVING TIP: You’re considering UniMove for your 50 Lb. bags? Once you make that lifting chore effortless for your employee, you might want to consider going to 100 Lb. bags. You will realize a reduced cost/Lb. of the raw material Plus you will reduce the handling required by 50%. If the layers of Kraft Paper contain a layer of polyethylene, or a poly-lined Kraft layer, then the porous load ratings published for UniMove are fairly accurate. If there is no poly liner, then go to the next higher capacity UniMove. To determine the ability to lift a particular carton, look for the Star Label on the bottom carton flap, which shows carton specifications. It often shows the Gross Weight Limit (GWL) of the carton. The GWL capacity is almost always a good indicator of whether or not the UniMove can handle that box. The Gross Weight Limit of the carton should be equal to, or greater than the total filled weight to be lifted. If the GWL is less than the actual total carton weight, the flaps of the carton might be too weak, and/or too porous, and can deform under the weight and not allow for a safe lift. NOTE: UNIMOVE, LLC and it’s recognized dealers cannot safely recommend a UniMove lifting unit for a carton whose weight is greater than the carton’s published GWL. If the box has no printed capacities, or if you are unsure about the UniMove’s ability to lift your load, you can determine if a safe lift is possible by a demonstration from your local dealer, or by sending a box to UNIMOVE, LLC for evaluation in our Lab. These are incredibly porous, and widely different. The tighter the strapping, the easier it is to lift with vacuum. The Spine side is easier to lift than the Lap, or fluffy side. If the bundle is too porous for vacuum lifting, then we can use a mechanical hooks which engage at two points of the upper strap.